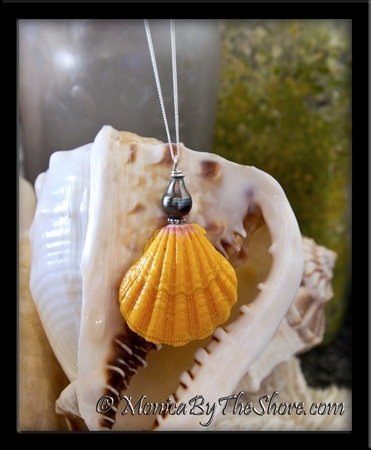 An extremely large, mature, bright yellow and pink Hawaiian Sunrise Shell from the North Shore ocean waters is accented with a large teardrop shaped Tahitian Black Pearl. This incredible Sunrise Shell is 1 5/8 inches in size, thats about as large as they grow! The shell and pearl pendant hangs from an 18 inch sterling silver curb chain necklace with lobster claw clasp. A one of a kind design, and as always, made entirely by hand without chemical cleaning of the seashell. Polynesian elegance in a size to draw gasps of attention and plenty of compliments everywhere you go! A Spectacular shell! 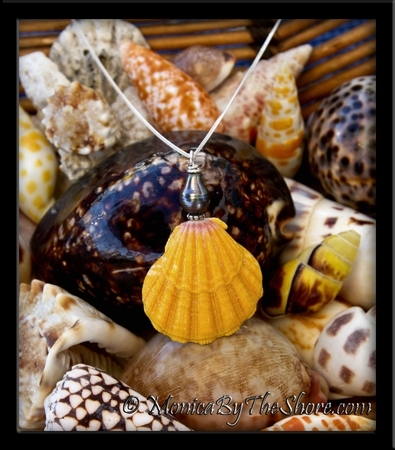 Hawaiian Sunrise Shells jewelry designs by MonicaByTheShore of the North Shore of Oahu, Haleiwa, and Honolulu, Hawaii. Each unique creation is hand made with Aloha and respect for our Ocean treasures.